For the past few seasons, I've thoroughly enjoyed my position as the team manager of one of the smallest, most elusive, most mysterious, most underground, and most secretive ski and snowboard teams ever assembled. In fact, some may say that I've enjoyed it a little too much... and why not?! I seriously have one of the best jobs in the whole world...! Scouting talent, designing graphics, shipping packages to some of the coolest people that I'll ever have the pleasure of knowing- it's a great gig that I've got here, and I wouldn't give it up for the whole wide world...! 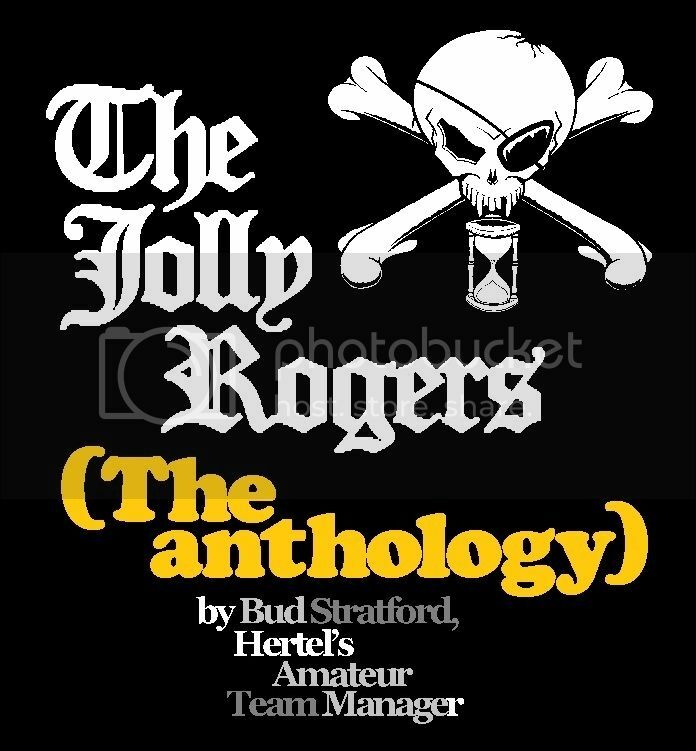 In order to celebrate all that the team has accomplished over the past few seasons, I've decided to write a short anthology of "The Jolly Roger Program" (aka, the Hertel amateur team). As the team manager, I'd also like to take a few moments to thank the guys, and the gals, for everything that they've brought to the team, and for their hard work. Here's to you...! -B.S. When I first started brainstorming the concept for a factory-sponsored Hertel amateur team, I wanted to do something a little bit above and beyond the traditional “team” concept. Terry, for his part, probably would have preferred that the am team to be called something simple and logical, like “Team Hertel”. 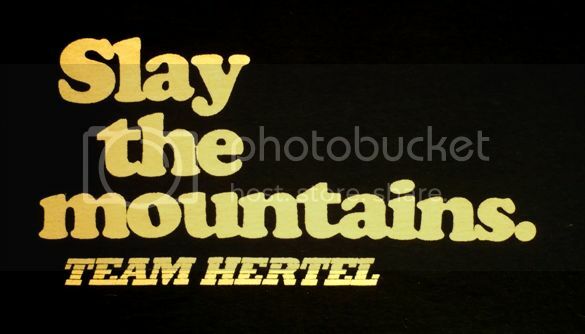 Actually, right from Day One, all of the team tees have had small “Team Hertel” logos on the front and back, as a little nod to our beloved boss. But we also decided very early on, that we were all a little bit tired of the same 'ol, same 'ol, "Team Whatever" paradigm. So right off the bat, the consensus was that we had to have some completely separate name, and image, quite distinct and removed from the company. It was time to change the game, and try something new and different, and a bit more unrestrained uninhibited than your "typical" ski or snowboard team. 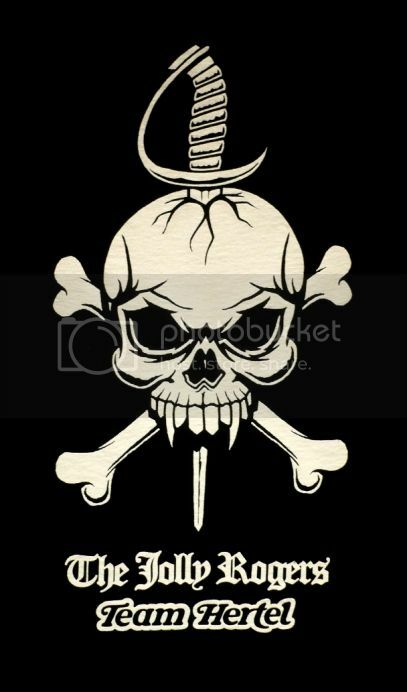 2011/12, The First Jolly Rogers Season: Simple "Team Stripe" logo front, with the OG Skull and Crossbones Logo rear (with "Team Stripe" logo underneath), white on black colorway. Terry's objection to the "Team Stripe" logo lead to this logo only being used on the 2011/12 tees, and (mistakenly) used on some of the 2012/13 line. 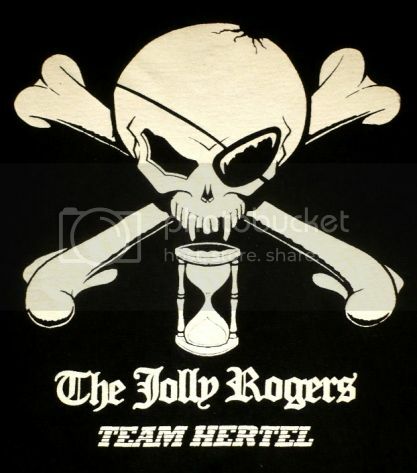 This is the only Jolly Rogers tee to not have any sort of saying, slogan, or soundbyte on the front. More than anything else, I wanted to put together a team of really relatable guys and gals, that anyone and everyone could talk to, hang out with... and (if they chose to), emulate. The sad fact is that, most pros aren’t all that relatable to most people. Most people will never be a pro. Most people will never snowboard (or ski) like a pro. Most people will never make pro money, get pro perks, or live the pro lifestyle. And this might be a personal bias here... but really, I’m far more inspired by the everyday rippers that I see at my local mountain, than I am by any pro. What I really wanted to build, was a team of everyday rippers that anyone and everyone could be a part of. And, I wanted to have guys and gals on the team that truly wanted to be a part of it for the love of the pastime, the love of the product, and the love of the company, and the team. Money, after all, corrupts everything. But love is always the best reason to do something. Besides, pros get enough recognition as it is. I thought that it was time to give the amateurs a little bit of the spotlight for a change. Considering that an “amateur”, strictly defined, is someone that does something purely for the love of it… I thought that sponsoring amateurs was by far, the best way to go. And if “amateurs” are good… then fun, intelligent, relatable, clever, troublemaking amateurs must be even better! Right…?! 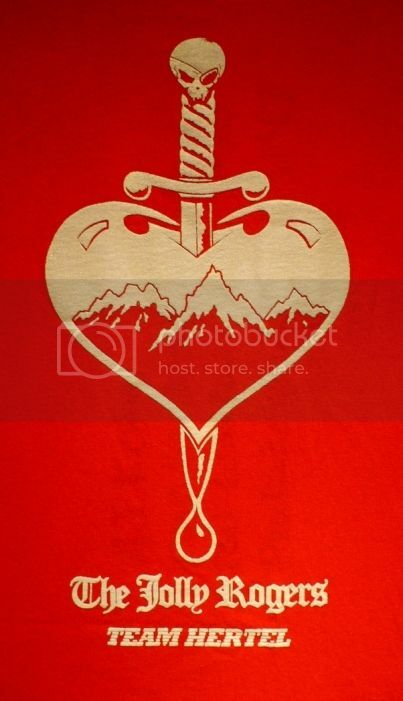 2011/2012 Late-Season Release: "Slay the mountains" (with "the Team Stripe" logo) on the front, with the "Heart and Dagger" (with the "Team Stripe" logo) on the rear, off-white on red colorway... this is the only red Jolly Rogers tee ever made. All Jolly Rogers tees are black from here on out. Terry's objection to the "Team Stripe" logo lead to this logo only being used on the 2011/12 tees, and (mistakenly) used on some of the 2012/13 line (see the OG, above). 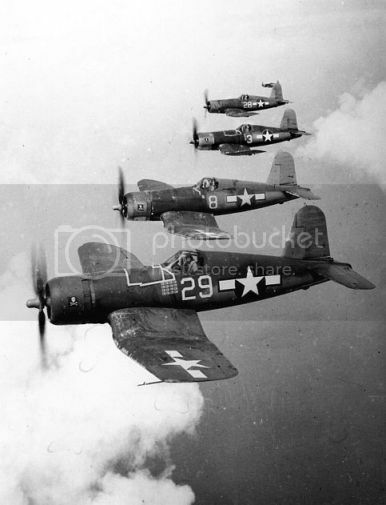 F4U Corsairs of Tommy Blackburn's original VF-17 "Jolly Rogers" squadron. Photo from Wikipedia. 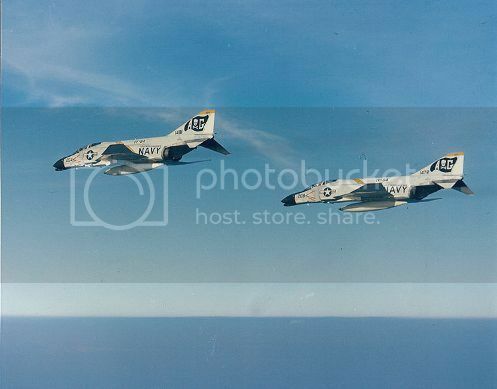 F-4B Phantoms of VF-84's "Jolly Rogers". How badass is that...?! Photo from Wikipedia. 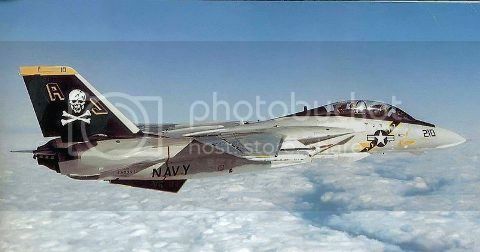 F-14 Tomcat in the definitive VF-84 "Jolly Rogers" paint scheme. Photo from Wikipedia. It wasn’t until I started doing research for the annual “team tees”, that I became fully aware (and appreciative) of the pirates’ history and legacy surrounding The Jolly Roger (the seagoing variety). As far as naming the team goes, it was a pretty simple leap of logic. Snowboards and skiers could easily be considered “flying pirates”, couldn’t they…? And, I liked the badass imagery of The Jolly Roger. The skull and crossbones motif pretty much says everything that needs to be said about this crew. Elaboration or explanation isn't really necessary. 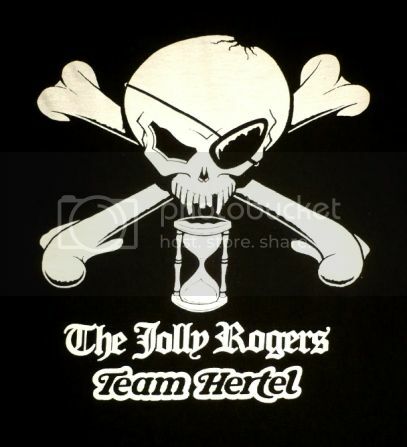 With that, “Team Hertel” was out, and “The Jolly Rogers” were born. 2012/13 Season (I think): What we have here, is camera-ready artwork for the team stickers. You can't really can't have a team without team stickers, can you...?! The most frequently asked question that I get (understandably enough) is, how exactly does one become a Jolly Roger…? It's actually not all that hard to do. Provided that you're the right kind of person, with the right mindset. At first, we simply picked up longtime Hertel customers and supporters. 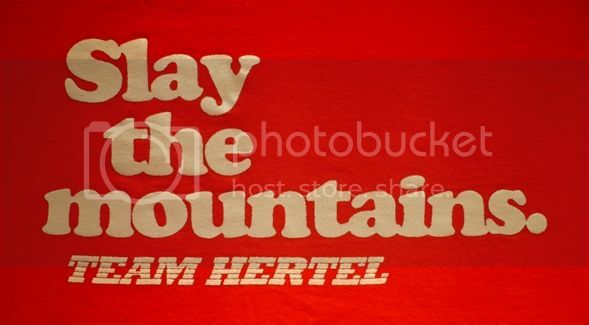 Hertel customers tend to have the "right mindset", right from the get-go. Being Hertel customers means that they're already fairly far removed from the "mainstream" of wax users, most of whom still ride (and swear by) that crappy crud that our competition puts out year in and year out. Just by being Hertel customers, they're already bucking trends and breaking established "rules" by tirelessly supporting a small, American-made, underground, performance-minded company. To recruit the first round of Rogers, we ran an impromptu contest (via Facebook), where prospective Rogers had to submit a short essay, explaining why they thought that they should be on the factory team. Later, the original team started recruiting fellow Rogers from their friends and acquaintances. The team grows a little bit each year, as more and Rogers bubble out of the woodwork, and join the original crew. We don't usually go looking for new Rogers; they tend to find us just fine. We’re very particular about who makes the squad. Generally speaking, you don’t have to be the world’s best skier or snowboarder to make the team. It’s more of a mentality, a matter of perspective, an attitude, and a lifestyle. This team is more about bringing together kindred spirits, then it is about promoting a slippery and durable base lubricant. The bottom line is that if you belong, then you’ll make the team. And if you belong, you’ll definitely know it. 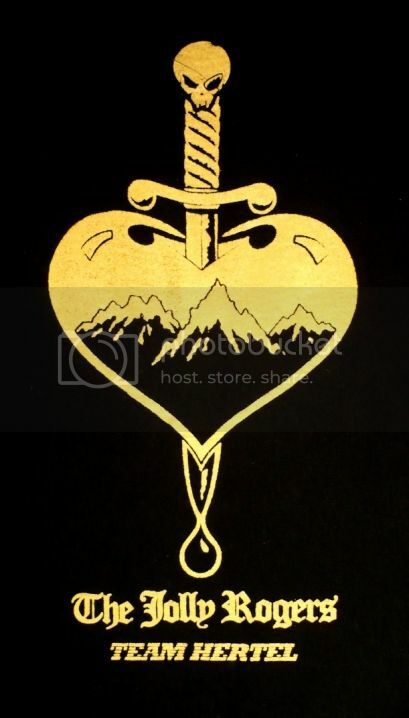 2012/2013 Early-Season Release: "Slay The Mountains" (with the original "Team Stripe" logo), with the "Heart and Dagger" (with the "Team Stripe" logo) on the rear. This one had the new cream on black colorway, to replace the red colorway from the previous season. This one should have had "New Logos" front and back, but a mix-up at the screener caused the "Team Stripe" to remain. This one introduced the website sleeve-screen in Cooper Black. While The Jolly Rogers were originally intended to be a promotional tool for the company, the first mission for the original Rogers was to field-test the reformulated Racing 739 for the 2010/2011 season. 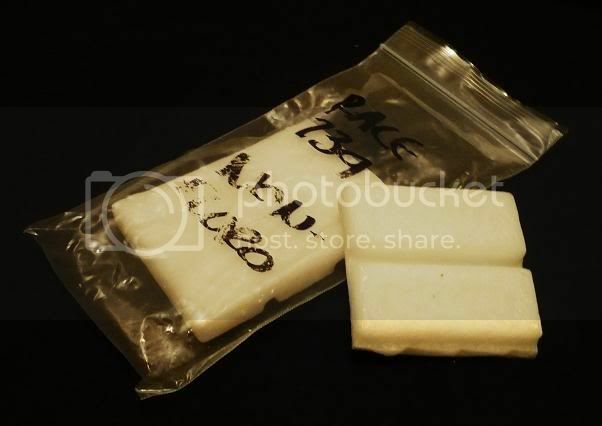 This is one of the great perks of being a Roger: getting to ride the very best, new, unbeatable wax formulas before the general public gets their hands on 'em. One of the first assignments for The Jolly Rogers, was field-testing the reformulated Racing 739. Getting our paws on Terry's newest brainstorms is always one of the neatest perks of being a Roger...! Since that original lineup, The Rogers have also field-tested the top-secret “RacingPLUS+” (2011-2012), and the reformulated Spring Solution (2012-2013). The Rogers do lots of other things as well. They promote their local scenes, and make tangible contributions to those scenes. They keep people stoked on snow sports, show folks how to tune up and wax their gear, and generally bring a fun, positive vibe to the mountain. Many Rogers have homegrown tuning shops, where they'll happily wax equipment for their families and friends. By bringing in new participants to snow sports, and by encouraging them to cut loose, be creative, and have fun, The Jolly Rogers insure that snow sports can stay happy, healthy, and fun for a long, long time. 2012/2013 (The "unauthorized" team tee): "Ask me about the fastest wax ever" (with the "New Logo") front, with the "OG Skull and Crossbones Logo" on the back (with the old "Team Stripe" logo). Website sleeve-screen in Cooper Black, white on black colorway. This one should have had "New Logos" on the front and back, but a mix-up at the screener caused the old "Team Stripe" to remain on the back. Every summer, every Roger gets an e-mail, unveiling the “team tees” for the upcoming season, and taking product requests for fall deliveries. Every Roger gets one, well-filled package every year, containing a crap-ton of exotic waxes, stickers, scrapers, base cleaners, or whatever other tuning supplies they may need… as well as a handful of that season’s “team tees”. Terry is also available all winter long, to send additional supplies as needed. 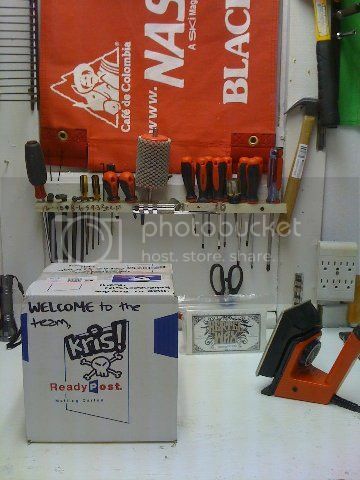 Kris' very first "team package". Note the hand-drawn skull-and-crossbones...! It's supposed to be fun, right...? Well then, let's have some fun with it, shall we...?! The “team tees” change for every season (see the “team tee” chronology for details). So far, we’ve tended to run a couple of designs every year, just to keep things fresh and fun. Most of them are approved by Terry... but not all of them. “Unauthorized” Jolly Rogers tees have been made, just for troublemaking purposes. We’re pirates, after all. As pirates, breaking rules is just part of the gig. Everybody on this crew lives to get busy, ride hard, ride often, cause trouble, wreck stuff, party hard.. and have a damn good time doing it. Because that’s what it’s all about. Right…? New for 2013/14! The 2013/2014 (Unauthorized) Reissue: "Ask me about.." (New Logo) front, with a revised "OG Skull and Crossbones Logo" (New Logo) rear. White on black colorway. For this year, the revised OG Skull and Crossbones logo has more symmetrical shadowing on the lower bones (previous OG's had more shading on the right bone, than on the left). Terry's objection to the "fastest wax ever" bit continues to keep this one extremely limited to only Hertel factory team riders. 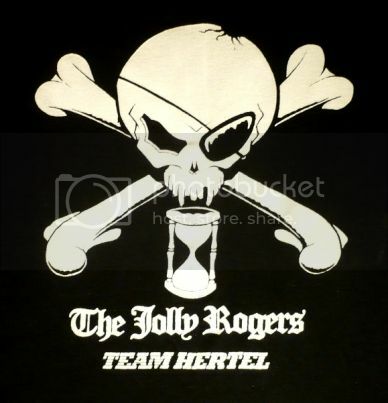 In the past, the only people that were allowed to get Jolly Rogers/Team Hertel gear, were the team riders. In the spirit of inclusion, we've decided that, for the 2013/2014 season, we're going to make Jolly Rogers tees available to the general public on a very, very limited basis. 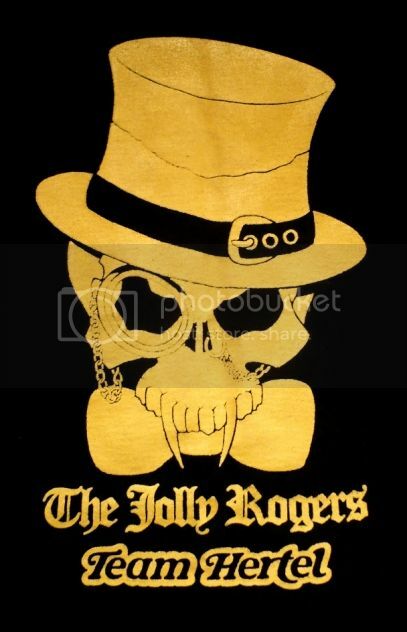 That way, anybody that wants to rock a Jolly Rogers tee, can. These will be available exclusively through Tognar Toolworks, at www.tognar.com. 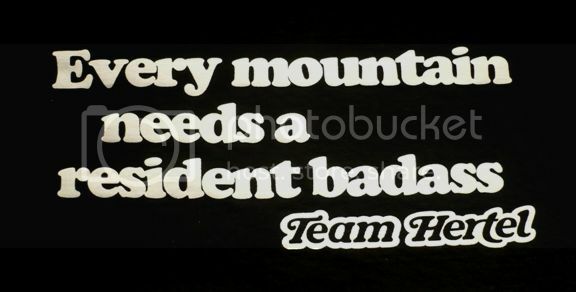 New for 2013/2014: :"Every mountain needs a resident badass" (New Logo) front, with the "Bones N' Dagger" (New Logo) rear. This year, these tees will be available to the team (as usual). But for the first time ever, this one will also be available to the general public, exclusively through Tognar Toolworks (www.tognar.com). This crew grows slowly and steadily every year. This year, we unveiled the “Sponsor A Buddy” program- just to make sure that wherever and whenever The Rogers ride, nobody has to ride alone. Every year, new sponsorship requests and recruits trickle in. And every year, a couple more lucky guys and gals secure permanent places on the squad. Because once you’re a Roger, you’re a Roger for life. 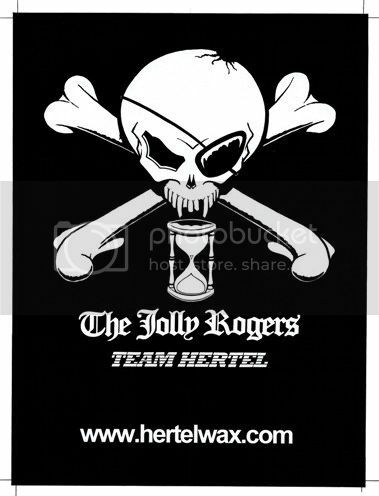 And just as The Jolly Rogers have stayed steadfastly loyal to Hertel, Hertel remains steadfastly committed to supporting The Jolly Rogers.